Here is a straight forward empty No. 10 envelope addressed to Howard Wandrei from HPL. I have no idea what it originally contained, but Derleth saved it for the 3 cent Washington on the front cover. The group contents would be most appreciative and informative to all. 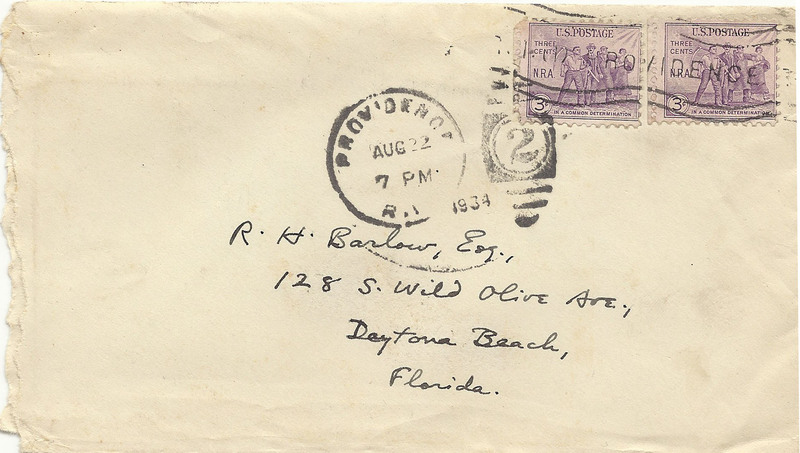 Here is an empty envelope from HPL to Robert Barlow in Daytona Beach. I believe he lives here before he moved to Mexico where he died. The little note on the back is intriguing. I wonder in the building at this address is still standing? or has it been demolished and rebuilt? Anyone want to check it out? 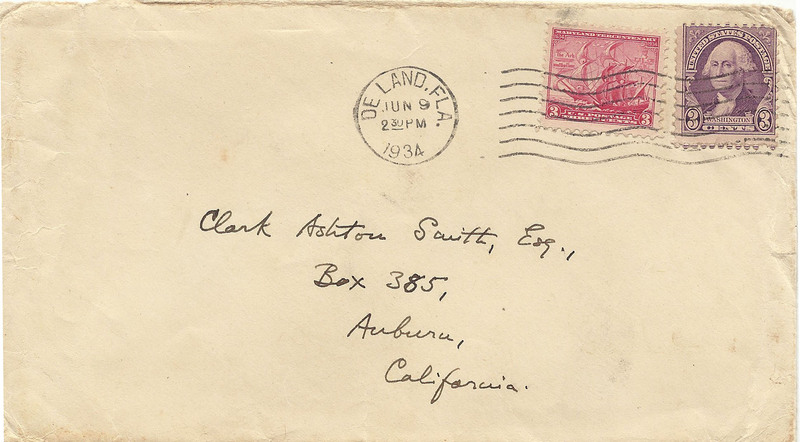 Here’s an empty envelope from HPL to Clark Ashton Smith. How it ended up in Derleth’s box of stamps is simply beyond me. However the return address at the V of the flap is characteristic, and the note is undecipherable to the uninformed, but I am confident the serious scholars will have fun with it. The contents of this envelope has undoubtedly survived in some collection or library somewhere. Your comments would be most appreciated. Here is another empty Registered Letter that was in that same box. 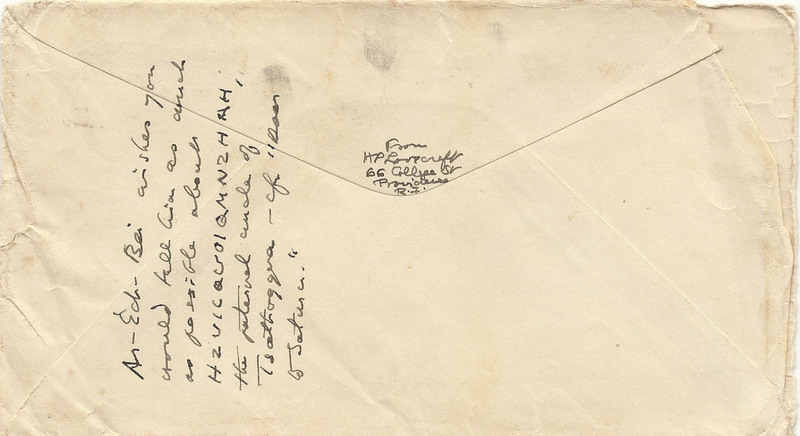 It is dated 12 April 1940 on the reverse, from Donald Wandrei to Derleth. I speculate that it contained Donald share of the the expense to produce “The Outsider and Others” likely a cashier’s check, money order, but certainly not cash. The letter and the amount might well be in the archives at The State Historical Society. This is dated before America entered the war, and Donald was subsequently called up to serve. 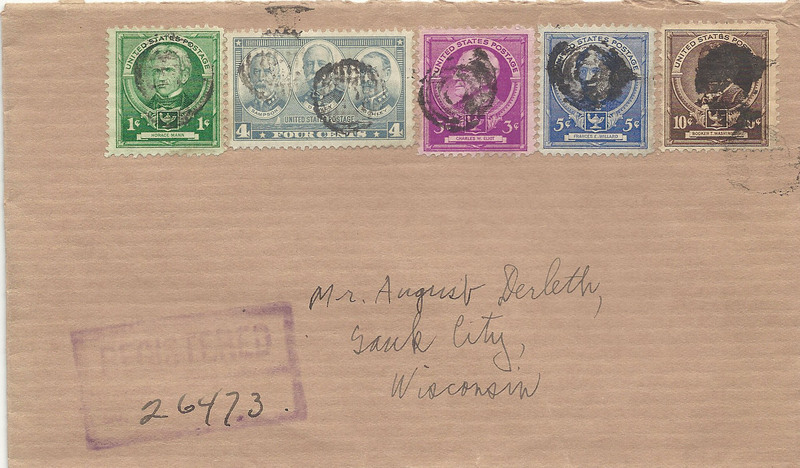 I purchased August Derleth’s stamp collection from April Derleth in 2010, and subsequently purchased Augie’s collection of FDC’s from David Rajchel the following year mounted in two blue binders. There was a box of stamps on paper, and envelopes and stationary dating right back to the 1930s. Here is but one of the covers. 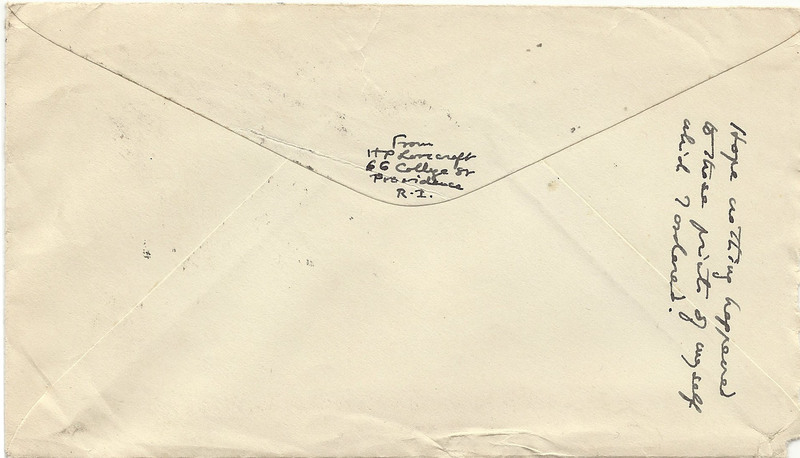 I speculate that this is the envelope that August received which notified him that he had won the prize, or perhaps it contained the check for $2,500 (Alison WIlson Bibliography). in any case August spent the money to bind his extensive collection of Comic Strips that he had meticulously collected since he was chilld. This collection now resides in the State Historical Society in Madison. Interesting! 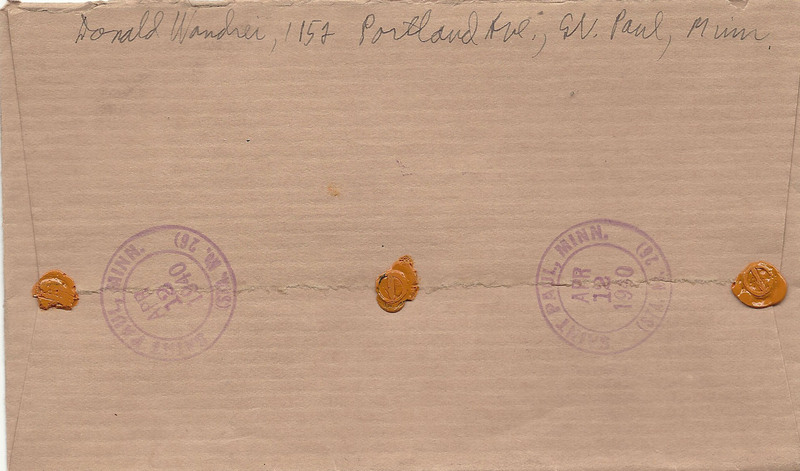 How a single envelope can tell a story. I am confident that Augie opened it, emptied the contents, and threw it into the box of philatelic odds and ends, only to be removed some 70 years later. One man’s trash is another boy’s treasure! Ephraim Burt Trimpey of Baraboo, Wisconsin was a photographer and a philatelist. He did photographic work for Arkham House and Derleth, and the two exchanged Christmas greetings. The back of the card featuring John and his wife in a sleigh is the inscription “Again old Dobbin and the Trimpeys bring you friendly Christmas greetings.” Here are three covers which Derleth saved for the stamps and not the envelopes themselves. I have described the Derleth cinderella elsewhere, but you should also not the strip of three 1 cent National Parks issue with a plate number “21247.” This was a common practice for Derleth. 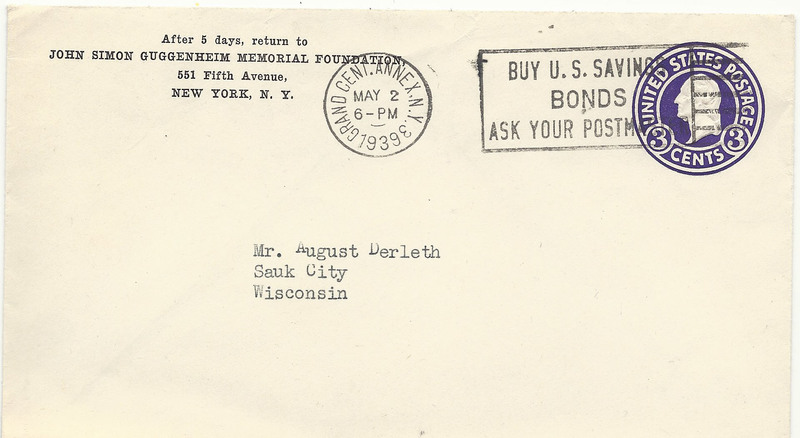 He would include a return envelope addressed with postage — many with collectible plate numbers — to his customers when sending book orders out. When Augie received payment he would add the used plate numbers to his collection. Also note the 1 cent George Washington with plate number “21826” and the motto “Portraiture of the Better Kind.” It is interesting to contemplate that what is ephemeral and quite disposable one day becomes a collectible in the following decades — in this case seven decades.